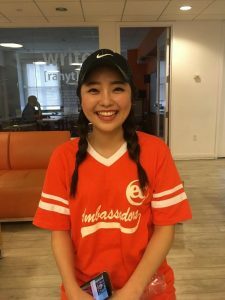 Jisun Baek is a student from South Korea who as been studying at EC New York since March 6th and will continue studying until August 20th. She is currently a student ambassador! Here is some more information about her experience at EC New York. Jiseun plans to be a flight attendant in South Korea. Improving her English would prove to be beneficial for her future career as a flight attendant. When she was young, she dreamed of going to New York. Now that she is here, she can enjoy New York and learn English at the same time! NYC has great transportation for someone like Jiseun who does not have a driver’s license; she can easily take the bus or train. Jiseun also loves how there are so many people from all over the world in New York, allowing her to make as many foreign friends as she likes. She is not the type of person who likes to learn English by just sitting at a desk. She feels that the teaching styles at EC New York allow her to learn English in a much more enjoyable, fun manner. She plans to attend New York University and further her English studies. Afterwards, she plans to go to the west coast but still has not decided what she wants to do there. What’s for sure is that she wants to become a flight attendant when she eventually goes back to South Korea. Thanks, Jiseun! Find out more about EC’s New York ESL school.